Los Angeles, CA - November 12, 2010 -- When it comes to personal safety, it’s always best to be prepared in advance. However, many personal safety tools can be too costly, cumbersome or even unsafe to carry on a regular basis. For this reason, Security Pro USA is suggesting that people look into using pepper spray as a useable and cost effective personal safety tool. As a company that markets defense tools to both civilians and government agencies, Security Pro USA is in the know about the best and most effective items people can carry to protect themselves against a possible attack. Pepper spray is a popular personal protection choice because it comes in easy to carry containers, and is not typically lethal. It gets its potency from capsicum, a compound that is found in chili peppers. In this formulation , the capsicum causes intense burning to the eyes and skin and can be used in defense against people and animals. 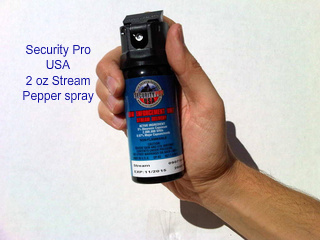 Security Pro USA now offers a new and more compact way to carry law enforcement grade pepper spray in a convenient 1.8 ounce canister with an easy to operate flip top. The range of the spray can reach as far as twelve to fifteen feet, and it is sold with a 5 year warranty. Security Pro USA says that this pepper spray is more effective than mace, another popular choice for self defense. It is a smart choice for anyone who wants to be safe in unfamiliar situations and places, and is a very inexpensive way to invest in personal security. However, Security Pro USA does recommend that anyone considering purchasing pepper spray should be responsible to learn the state laws and regulations of their state concerning the use of pepper spray, before making a purchase. Security Pro USA is a company that specializes in selling a wide variety of defense products. The company has been in business for over 20 years, and works with both private civilians, as well as clients in corporate and government settings.